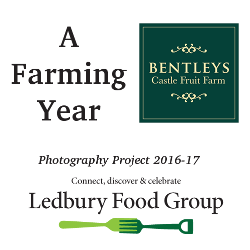 The Ledbury Food Group would like to introduce its second Photography Project in the “Ledbury Farming Year” series. The purpose of these projects is to get an inside view of the workings of farms and producers in our area, so that we can relate more directly to them and understand the challenges and rewards facing the people who bring food to our tables. 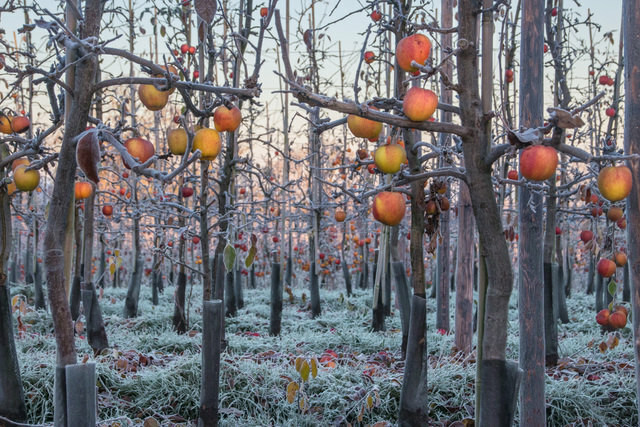 This year we will be featuring Bentleys Castle Fruit Farm near Dymock, and looking at not only the orchards, but at some of the issues facing a small commercial farm. As well as selling their fruit wholesale, it is sold at Jenkins greengrocers and seasonally at the Saturday market in Ledbury, the monthly produce market in Kempley and at food fairs in and around Ledbury. Photographs are being taken by Pat Strauss who is visiting the farm regularly to tell the story of the farming year in pictures. There will be monthly blogs by Chrissy and Michael Bentley that will give us an insight into day to day life on the farm. They will explore the delights and challenges of such things as seasonal weather and work on the farm, sustaining a healthy farm ecology, managing an international workforce, finding reliable commercial markets and developing their farm shop and other outlets. Our intention is to hold an exhibition in 2018 and there may be Castle Fruit Farm events during the year… so watch this space. 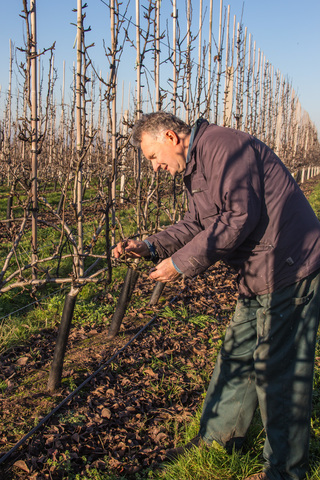 Chrissy and Michael took over the farm in 2002 with no prior experience of top fruit growing having been in arable farming for the previous 20 years in North Worcestershire. We rapidly realised that the old traditional ways of growing were not economic and after visits to Europe, and with help from our very able and forward thinking manager, set about planting in the new style of post and wire and with new varieties. 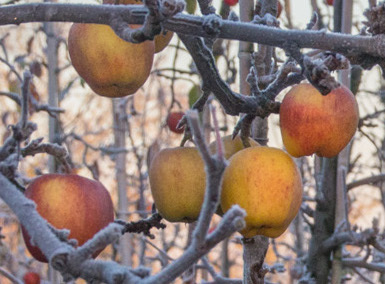 We continue to refine our growing practice as the market changes and take great pleasure in growing a large range of apples, pears, cherries, plums and cider fruit. 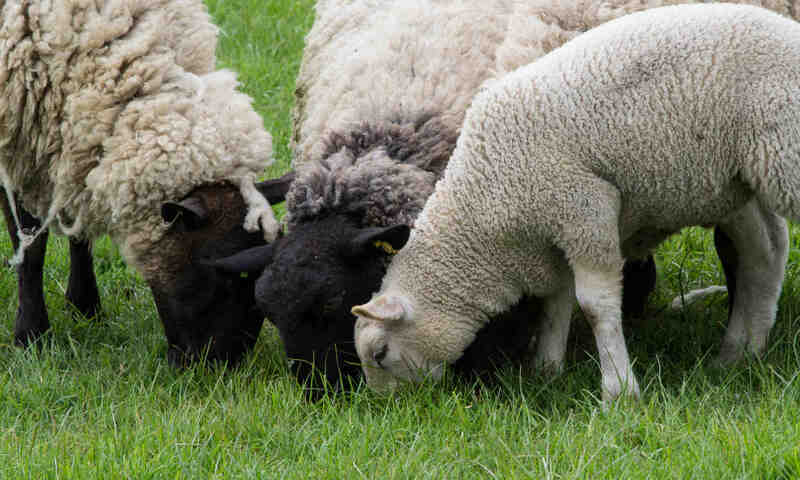 Additionally we are very keen to increase the biodiversity of the farm for many different reasons. We supply supermarkets and enjoy selling as much fruit as possible to local farm shops and directly to customers at our seasonal farm shop. Right now the last of the harvest is just about gone and the field fares, the thrushes and redwings as well as our local birds are feasting on the remains. We must wait until June for our first crop which is cherries !